The recording of today's webinar, "Find Your Roots in German Farm Histories” by Gail Blankenau is now available to view at www.FamilyTreeWebinars.com for free for a limited time. Until the early 1900s, the majority of the population in the Germanic states was engaged in agriculture. Thus, most of us with Germanic heritage will have at least some ancestors engaged in farming. German farm customs were different from those in America and German farmers were tied to their land in ways that American farmers were not. Particularly in the earlier years, the history of your family's farm was integral to the history of your family. If you could not make it to the live event or just want to watch it again, the 1 hour 32 minute recording of "Find Your Roots in German Farm Histories” is now available to view in our webinar library for free for a limited time. Or watch it at your convenience with an annual or monthly webinar membership. "For those of us who tinker with the search strings for various websites, could there be a place on the Legacy website that would have the "original" strings as supplied with the program for us to download or copy to repair the mess "we" have made and are unable to correct?" We don't have this as a download but the information is readily available. 2) Open Legacy and go to Search > Search Internet. Don't do anything. Just close the dialog box again. 3) Now go back to the \Documents\Legacy Family Tree\_AppData folder and open it. You will notice that you now have an iSearch and an iSearchX folder. Rename the iSearch folder to iSearch ORIGINAL and then rename iSearchX to iSearch. What you have done is created a clean copy of the folder with the original strings (now iSearch ORIGINAL) which will leave any changes that you have already made still in place (now iSearch). Open the iSearch ORIGINAL folder. You can open any of these files with Windows Notepad. You will see the original search strings (both lines). If you ever get into a bind you can open this file and copy and paste what you need. If this is something you are interested in trying out yourself, go to Search > Search Internet > Customize Searches. Highlight the search you want to work with and click Edit. Now click the Help button on this screen for detailed instructions. See you at RootsTech 2018! Join us this week at the world's largest in-person genealogy conference - RootsTech in Salt Lake City! With tens of thousands of attendees, hundreds of exhibitors, and some pretty cool speakers (Scott Hamilton, Henry Louise Gates, Jr., Dallin H. Oaks and Hank Smith among others) it's the genealogy event of the year! Also, visit us at the Legacy Family Tree software and webinars booths - numbers 1336/1337. The Legacy developers plus both Geoff and Marian will be there, so bring your ideas, your recent genealogy success stories, and of course your wallet - as always we'll have RootsTech-special pricing on our software. Also we'll have your conference ribbons and "Life is Short, Do Genealogy First" wristbands to share. If you can't make it, join online. Many of the conference sessions will be streamed live. Here's the streaming schedule. Join us and Gail Blankenau for the live webinar Wednesday, February 28, 2018 at 2pm Eastern U.S. Register today to reserve your virtual seat. Registration is free but space is limited to the first 1,000 people to join that day. When you join, if you receive a message that the webinar is full, you know we've reached the 1,000 limit, so we invite you to view the recording which should be published to the webinar archives within an hour or two of the event's conclusion. 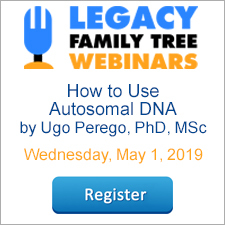 The recording of today's webinar, "Legacy 9 Unlocked (part 2): Adding an Online Document” by Geoff Rasmussen is now available to view at www.FamilyTreeWebinars.com for free for a limited time. In this class, “Adding an Online Document,” you will learn the seven steps of adding any online document to Legacy. If you could not make it to the live event or just want to watch it again, the 1 hour 25 minute recording of "Legacy 9 Unlocked (part 2): Adding an Online Document” is now available to view in our webinar library for free for a limited time. Or watch it at your convenience with an annual or monthly webinar membership. Legacy has many reports and charts you can use to share data with other researchers or your family members but there are also some other ways. You can upload a gedcom to one of the "tree" websites such as MyHeritage. You can see the instruction on how to create a gedcom HERE. Once you have created your gedcom you can follow the instructions HERE on how to upload to MyHeritage. If you are using one of the other tree sites they will have instructions available to you. You can also create webpages in Legacy and then upload them to your own website. To be able to do this, you will need your own web space. If the hosting company does not have a way for you to upload your webpages then you will also need one of the free FTP clients. We use and recommend FileZilla. Legacy makes creating webpages easy. The screens and options work very similarly to creating reports. On the main toolbar click the Internet tab and you will see the different styles of webpages you can create. You can see that the Web Page Creation screen looks similar to reports. You will find all of the options by selecting the different tabs at the top. Don't forget the Privacy Options button over on the right. Legacy will do all of the work for you but if you are familiar with HTML you can easily edit the created pages in a text editor. You can read more about webpages by clicking the Help button on this screen. There is one really nifty thing you can do with webpages that many users don't know. When you create your webpages all of the pages and images will be in a single file in the Documents\Legacy Family Tree\Web\ folder (or location of your choice). You can zip that folder and then send it to a family member. To zip it, right click the folder and select Send to > Compressed (Zipped) Folder. You can then send that zip file to your family. It might be too big to send by email so I recommend you park it on cloud storage such as OneDrive, Dropbox, or Google Drive and send your family a link to download it. After your family member downloads it to their hard drive all they have to do is find the Index.html (or Index.htm) file inside and double click to open it. It will open in their web browser. All of the hyperlinks are internal so they will work. They will be able to view it just like if it was a real webpage online. Another way to share your data with someone is to send them a gedcom of your file. They will be able to open the gedcom in whichever genealogy program they use. However, most family members don't have a genealogy program. 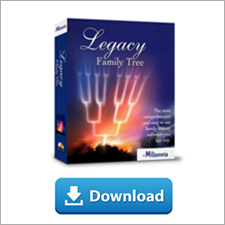 You can have them download the free Legacy Standard Edition and then instead of sending them a gedcom file you will send them a backup file. You can send them your data file only or you can send them your media backup as well. You can point them to these directions, Tips for Restoring Files and How to Restore Media Files. Legacy gives you many different options to share your data with other researchers and with interested family members. Every Friday we're pleased to offer Legacy Family Tree Webinar subscribers a new bonus webinar just for them! This Friday enjoy "Online & On Track: Railroad Records, Indexes, and Finding Aids on the Internet" by Paula Stuart-Warren, CG, FMGS, FUGA. If you're not a member, remember the webinar previews are always free. See all the webinars by Paula Stuart-Warren in the Legacy library. Join us and Legacy's Geoff Rasmussen for the live webinar Friday, February 23, 2018 at 2pm Eastern U.S. Register today to reserve your virtual seat. Registration is free but space is limited to the first 1,000 people to join that day. When you join, if you receive a message that the webinar is full, you know we've reached the 1,000 limit, so we invite you to view the recording which should be published to the webinar archives within an hour or two of the event's conclusion. Available now, exclusively at FamilyTreeWebinars.com, is the fascinating full-length documentary of the Tribal Quest family history expeditions to remote tribal communities in Namibia, Papua New Guinea, and Siberia. Tribal Quest is a pro bono project, led by MyHeritage's Golan Levi of Melbourne, Australia, for documenting the family trees and stories of remote tribal communities that face a risk of cultural extinction. Join us and Golan's expedition in this brand new webinar at FamilyTreeWebinars.com for free. The recording of tonight's webinar by the Board for Certification of Genealogists, "Using Swedish Taxation Records to Solve Tough Genealogical Problems” by Jill Morelli, CG is now available to view at www.FamilyTreeWebinars.com/BCG for free for a limited time. If you could not make it to the live event or just want to watch it again, the 1 hour 29 minute recording of "Using Swedish Taxation Records to Solve Tough Genealogical Problems” is now available to view in our webinar library for free for a limited time. Or watch it at your convenience with an annual or monthly webinar membership.